The 2010 World Cup has started in South Africa. This means that for approximately the next month football – called soccer in the US – fans will be fixated upon the international competition, which happens only every fourth year, even more than they are normally riveted to the league play that they normally follow. Thus, even more than usual, the world will for the next month be filled with bored and more than a little annoyed football widows – and not a few soccer widowers like myself. That’s certainly worth following and I, for one, am certainly of fan of beautiful women wearing nothing but bodypaint, as previous posts prove. While I’m largely bored by futbol / football / soccer, I don’t think I could ever get bored with looking at beautiful women like: Abbey Clancy, Bethany Dempsey, Melissa Satta, and Sarah Brandner. I doubt that many men, even those like myself who are not fans of the sport, would do so. Once upon a time it was bards, minstrels, and artists that set the standard for beauty. In these later, degenerate times the standard for beauty is largely defined by the fashion and cosmetics industries. These groups have created the new form of idealized beauty that they’ve decided that women should strive to emulate. But what is the ideal standard that these fashionistas are promoting? What do they want to demand that women to look like? 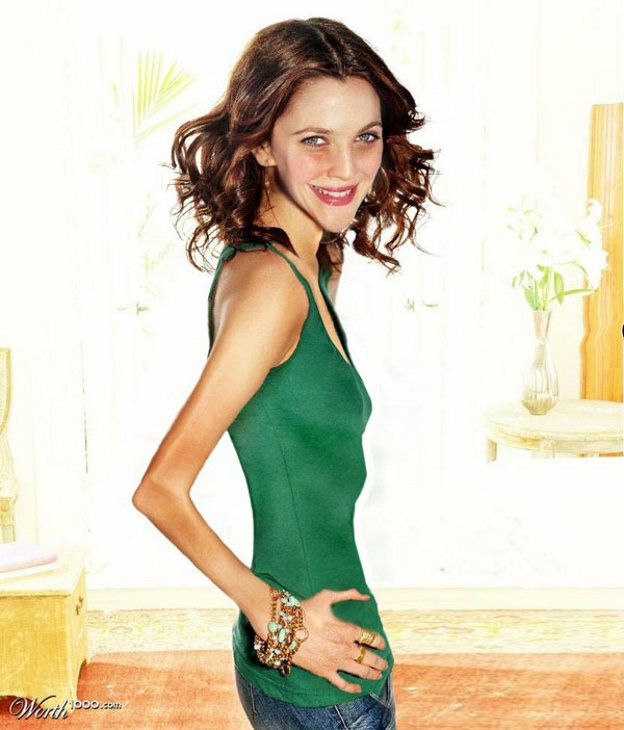 To properly illustrate their fantasy of idealized beauty I’ve gathered the images of 18 female celebrities that have been photoshopped in order to present these women as fashion industry would desire them look. What’s the most sickening thing about those Auschwitz-esque images is that they’re not that far off from what the fashionistas actually demand that their models look like. Skeletons Dipped In Wax Anyone? Long ago a particularly nasty and utterly disgusting subvariety of queers and a number of ugly, bitter spinsters infiltrated, infected, and suborned the fashion industry. Since then they have developed a standard of “beauty” that has nothing to do with women’s beauty and everything to do assuaging their own well-deserved feelings of inadequacy. Sadly though, they’ve been allowed to get away with it for the most part, largely because $60 billion weight loss industry is a major set of advertisers in fashion magazines. Yeah, there’s a $60 billion dollar per year global weight loss industry willing and eager to sell women “self respect” for what they consider a very modest recurring fee. That, combined with a fashion industry largely controlled by flamers and failed-at-being-women females is enough to make any right-thinking man wish that dousing these enemies of mankind in gasoline and lighting them up was legal – or that one could get away with it long enough to make doing it worthwhile instead of being just a selfish pleasure. The fashionistas – with a very few exceptions – and their backers very deliberately ignore reality, especially when it comes to what sizes real women are. Respectively, their self-images and wealth are dependent upon propagating a standard of idealized beauty that is unachievable. These creatures should not be allowed any public forum in which to mouth their opinions and “ideas” and should be forcibly driven from any that they now enjoy by any means available and with as much lasting damage inflicted upon them as we can manage. That we allow them exist at all is a grievous sin that the Gods will certainly punish us harshly for committing. Can you imagine the raving uproar from the Liberals if a member of the White House Press Corps had said at some Muslim group that the Arabs should “get the hell out of Palestine” and go back to Jordan and Saudi Arabia? Can you imagine how severe that response would be if the person who said it was Jewish or of Jewish roots? Pandemonium would ensure as every Liberal media outlet in America broadcast the story and the Muslims and their shills in America raged in bloody riots across the nation. The Muslims’ and Liberals’ calls for the person’s removal from the White House Press Corps would shake the heavens and the person in question, now branded a raging bigot and Islamophobe, would be instantly banned from President Obama’s White House. 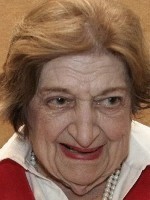 But when Helen Thomas, an Arab born within America and the �Dean� of the White House Press Corps standing outside a White House Jewish heritage event on May 27, 2010, told Rabbi David Nesenoff her opinion of Israel was that the Jews should “get the hell out of Palestine,” and added that Palestine is a country of occupation, whose occupiers should leave the region, returning to “Poland, Germany and America and everywhere else” there was no outcry at all by the MSM. The incident didn’t reach the American public’s attention until the Drudge Report publicized RabbiLIVE.com’s video of the filthy Arab’s antisemitic screed against America’s only sincere ally in the Mid-East. Of course, once it was caught, Helen Thomas “apologized” and many including her employer Hearst Newspapers, seem to willing or eager to let the matter drop, though the agency that represents it, Nine Speakers, Inc., did drop it like the piece of filth that it is. Sure; whatever it says. It’s only sorry that an American actually managed to draw enough attention to its statement that it might suffer some far more than well-deserved discomfort. Thomas is 89 so there’s little point in her extermination, but part of me says such a curettement should be still be performed for the public health, as a matter of principle, and to send a stern message to America’s foreign and titularly domestic enemies. Other parts of my soul remember that we Americans cannot protect the health of nation in that way due to the inviolate 1st Amendment of our Constitution. That’s probably for the best, since it would set a precedence that our enemies, both current and future, might use it to America’s detriment. Obama’s White House, utterly unsurprisingly, seems to have no problems or issues with either Helen Thomas’ antisemitism or its fondness for Jew-baiting. It’s beyond unlikely that they’ll censure it in any way unless forced to do so by the American people, and even that seems more and more unlikely to be successful as Obama’s regime further divorces itself from we, the People. Two would-be jihadis, bent on attacking US troops were arrested at JFK airport in Queens, NY late last night (Saturday, June 5, 2010) by the FBI and NYPD. 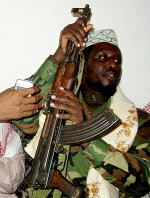 The vermin were trying to go to Somalia to join up with the Al-Shabab insurgent group which is tied to Osama bin Laden�s Al-Qaeda network. The jihadis, Mohamed Hamoud Alessa of North Bergen, NJ and Carlos Eduardo Almonte of Elmwood Park, NJ have been charged with conspiring to commit an act of international terrorism. NEWARK � Two New Jersey men intent on killing American troops were arrested Saturday as they boarded flights to link up with a virulent jihadist group in Somalia, authorities said. The men, both North Jersey residents, were charged with conspiring to commit an act of international terrorism through a group tied to Osama bin Laden�s al Qaeda network, according to officials familiar with the details of the arrests. Mohamed Hamoud Alessa, 20, of North Bergen, and Carlos Eduardo Almonte, 26, of Elmwood Park were apprehended at John F. Kennedy International Airport in Queens before they could board separate flights to Egypt, where they were to start journeys to Somalia. The men were arrested by teams of state and federal law-enforcement agents who have been investigating the pair since October 2006, according to the officials, who requested anonymity because they are not authorized to discuss the operation publicly. “Two individuals were arrested at JFK in connection with an ongoing investigation. At this time, we can provide no further details because the investigation is ongoing. The arrests do not relate to an immediate threat,” said Jose Lozano, a spokesman for the state Office of Homeland Security and Preparedness. The arrests were the culmination of Operation Arabian Knight, a joint federal and local investigation, during which an undercover NYPD police official befriended the two traitorous scum and monitored their jihadist activities and travel plans since 2006. Like the animals, Nidal Hasan and Faisal Shahzadt, Alessa and Almonte are US citizens. The charge of treason should be added to the indictment and the death penalty sought as the sentence. Sadly but unsurprisingly for America, neither President Obama or his boy, Attorney General Holder have the desire to fully prosecute Muslim “Americans” or their dhimmi allies – or, frankly it seems, most non-White offenders. Despite it being based upon a postulate that has been deprecated as largely false and entirely unproven, I could almost respect the people who made this video. It shows a firm commitment by its creators to a cause and refusal to turn a blind eye to unpopular or politically incorrect solutions. Want To Slow Global Warming? Stop Immigration! If both everything and only that which the Warmists claim were true, then this video would be, by and large, true. Halting or greatly reducing and restricting immigration to America from the Third World would slow the rate of Anthropogenic Climate Change. It’s grim and scary fact that the US Census Bureau’s middle and most likely projection is that the US will add 120 million people to the population of the U.S. by 2050 and that 67% of this population explosion will be due to immigration and the progeny of immigrants. Even to the majority of people, those who haven’t bought into Al Gore’s doomsday cult of AGW, have to see that these numbers are not sustainable. If the US Census Bureau’s projections are close to accurate, America� has a future measured in years and not very many of those. Whether true or not, this video and the intent behind it is stupid. It’s farcical to think for a moment that Greens, Liberals, and Progressives who make up the Warmists would ever entertain any thought that was not expressly and� actively pro-immigration and/or pro-minority. Those sorts would never consider advocating such things as limiting immigration from Third World areas. Irrespective of whatever they’ve ever stated about the problem of Global Warming, their chosen solutions have always had far more to do with wealth distribution than with combating Climate Change. At the most fundamental level, if that wasn’t the case, then they wouldn’t have mono-focused on CO2 emissions from fossil fuels. They would have also looked at CO2 emission levels from biofuel / biomass production and that of charcoal, which is a primary fuel for much of the Third World. They also might have – still adhering to their postulate of Anthropogenic Global Warming� of course – done some serious research into the climatic effects of the levels of deforestation both these processes cause. But such things are not and never will be part of any Green’s, Liberal’s, or Progressives’ agenda. No matter what their current cause c�l�bre is, their “solutions” are all the same and do not include anything resembling the ideas in this video. It’s stupid to believe that the Green’s, Liberal’s, or Progressives’ have the capability or will to understand or to change their ways.